Below are some of my recommendations for artists’ materials, suppliers, and resources for artists. As I constantly try new things and learn from others, I’ll be updating the content frequently. 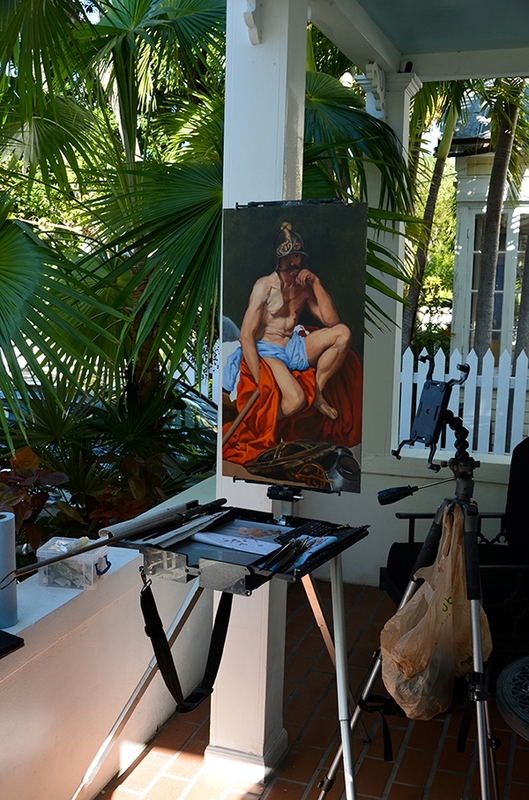 I work in a number of places, both indoors and out, and have different easels for each situation. When working inside at home or at the cottage, I have two types of easels that I set up in my studio space. One is called a Lobo Easel and the other is called the Classic Dulce easel, which has a sturdy, H-frame construction. The first easel was the very first one I bought years ago and it has proved to be sturdy, reliable and flexible; I can easily fold it up and put it away in a closet when I don’t need it. The Dulce easel is far stronger and more stable. I use it at home when I have large canvases to work on. I find that the best quality of easels are made by a company called Best and distributed by Richeson’s in the US or Above Ground in Toronto. 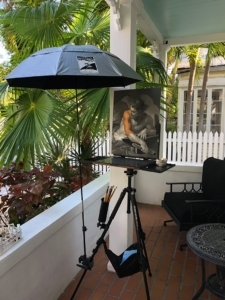 Whenever I’m away from my studios for a long spell (i.e., Key West in the winter) and can’t use a regular easel, I’ll bring along my Soltek Easel.. This is a one-piece aluminum easel whose legs that pull out to form a tripod. 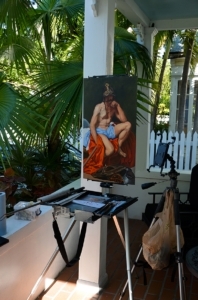 The main body of the easel contains a removable palette, side trays, and a storage compartment under the palette for transporting brushes, tubes and rags. An adjustable pole with brackets holds the paintings in place. It can accommodate large panels — 28” x 16” is the largest I’ve tried. Although it weighs 9 lbs, I can put it in my knapsack and I don’t need to carry a separate tripod. The only disadvantage I’ve found is that feet of the retractable legs are susceptible to dust and dirt, impeding their ability to extend in and out; protect them if you take yours onto a beach! For plein air painting trips involving air travel and long walks, I use a smaller, more compact easel from EdgeProGear . The model I have is called the PaintBook and resembles a laptop (15 1/2″ X 10 1/2″, 4lbs) sitting on top of a tripod (a good quality Manfroddo tripod). Panels sit on the easel’s lid and are held together with clips and/or magnets. The base of the easel contains a glass palette. I attach magnetic trays on the sides of the easels to hold brushes and cups. An LED light fits into the top of the lid and can angle it down to focus on my panel and palette. My PaintBook easel works well with panels up to 20” x 16” in size, even 1” cradled panels, although for plein air painting I like to work with 8″ x 10″ panels. Rosemary’s Brushes — These are superb brushes. I’ve ordered them while in the US and they arrived quickly within a few days.